Apple Pay is slowly growing around the UK – there are now 11 banks which support the service as both Halifax and Lloyds Bank have joined the roster. It's taken both the UK banks quite some time to join the original 9 launch partners, but it's now you can connect your cards up from today. It may take a little while to work, as it's only just rolling out, so be patient with it if it doesn't work first time. 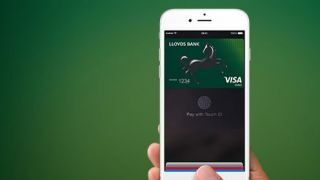 UK banks supporting Apple Pay now include American Express, First Direct, HSBC, Halifax, Lloyds Bank, NatWest, NationWide, MBNA, Royal Bank of Scotland, Santander and Ulster. The eagle eyed amongst you will notice that Barclays is still holding out on Apple Pay and refuses to give an exact date of when the rollout will be happening. If it doesn't happen soon Barclays is going to annoy quite a few of their customers by keeping them stuck in the payment past.